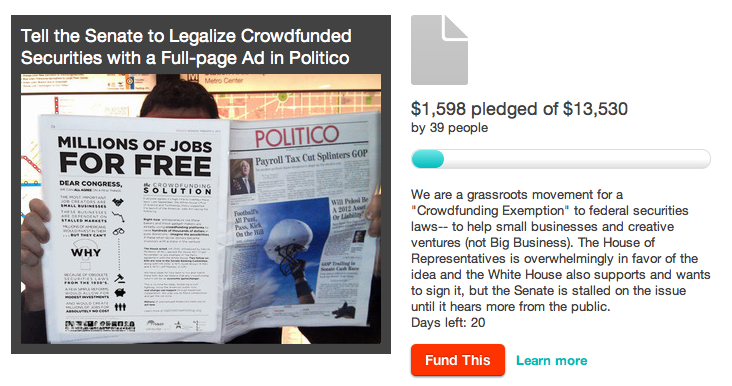 The New Crowdfunding Law: What Does it Mean? Now, What Does it All Mean? (Washington, DC) – The Jumpstart Our Business Startup Act (JOBS Act), H.R. 3606, passed the U.S. Senate on March 22, with overwhelming support (73-26). So what will the impact be, particularly as it relates to the CrowdFund Investing measure, for America’s entrepreneurs and small businesses? According to the three entrepreneurs who developed the crowdfunding framework, which was the basis for the legislation, it means a new source of funding, more jobs and a greater chance of success for small businesses. The U.S. House passed the Jobs Act on March 8 (390-23), and the U.S. Senate amended the legislation before its passage on March 22. House Majority Leader Eric Cantor (R-VA) said he plans to schedule a vote on the amended package early next week. This means the legislation could be signed by President Barack Obama next week, if the House passes the Senate amended bill (which it is expected to do). Investors (who must first take a short quiz to make sure they understand that investing in a business is a highly risky endeavor with no guarantees) will pick apart the entrepreneur, the idea, the business model and the investment opportunity in an open manner with other members of the community. Until 100% of a funding target is met, no money will be transferred, but once it is, an entrepreneur will have not only cash, but also a loyal customer/investor base. With the collapse of the markets in 2008, the traditional means of financing for startups and small businesses – credit cards, home equity lines, bank loans and venture capital – disappeared. Interest rates increased, home equity lines disappeared, and banks stopped lending to Main Street. Venture capital shifted to larger, more secure deals. A funding void ensued ($0 to $250,000 in financing) that no one has yet filled. According to the Small Business Administration (SBA), this is the most critical seed and early-stage growth capital necessary for success and the number one reason why startups fail in the first five years. The framework will allow friends and family to invest up to $1 million into an entrepreneurial enterprise, but individual investments are capped below $10,000. The capital will either go directly into hiring people or into the purchase of products or services. The crowdfunding platforms will lead to more community investing and more successful local businesses because people will have a vested interest in the success of these entrepreneurs. And why is this important? “Because a strong entrepreneurial ecosystem depends on access to capital. Freeing up new sources of capital – as the JOBS Act will do through crowdfund investing – will strengthen our nation’s small business sector, and add to their job creating capacity. Being accountable to community investors will enhance success,” says Karen Kerrigan, president & CEO of the Small Business & Entrepreneurship Council (SBE Council). About The Small Business & Entrepreneurship Council: SBE Council is a nonprofit, nonpartisan advocacy organization dedicated to protecting small business and promoting entrepreneurship. For more information, please visit: http://www.sbecouncil.org/. 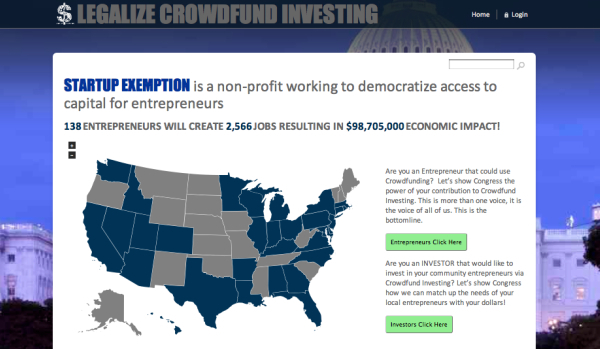 Startup Exemption, The CrowdFund Investing authors that wrote the framework for the Crowdfund legislation passed by Congress. Gate Technologies & GATE Impact, a platform and electronic marketplace and that provides regulatory compliant private market transactions. CFIRA is a membership organization that includes members of the CrowdFund Investing and donation-based crowdfunding community as well as representatives of related industries including angel and venture capital firms. CFIRA will provide intermediaries with regulation, reporting, and compliance oversight and will provide investors with educational tools to help make more informed decisions about the opportunities and risks of CrowdFund Investing. CFIRA is committed to working with the SEC to create reasonable and appropriate regulations and oversight to reduce fraud and protect investors. “Empowering Entrepreneurs to access limited amounts of capital to innovate and create jobs is an important part of this organization’s strategy,” said Jason Best, Co-Founder of Startup Exemption. “With uniform rules developed by the Industry that include social media, intermediaries will provide a regulated environment for CrowdFund Investing to take place with transparency and investor protection,” added Sherwood Neiss. “Both the legislation and the industry acknowledge the need for proper oversight to maintain efficient and effective marketplace. Particularly given the new nature of crowdfunding, delivering education that informs investors on the risks and opportunities of investments is the only way a viable industry can be created,” stated David Drake, Co-Founder of The SoHo Loft Capital Creation Events. “Organizations like these are good for our economy, good for the industry, and an essential part of our approach toward a secure and transparent marketplace that works for all Americans,” concluded Vincent Molinari CEO of GATE Technologies. Inspired by the JOBS Act, CFIRA is an industry-led effort that allows CrowdFund Investing intermediaries to register to oversee their operations in a way that is akin to other SROs that oversee the financial markets. About Startup Exemption Startup Exemption is the name Sherwood Neiss, Jason Best and Zak Cassady-Dorion created to describe their CrowdFund Investing (CFI) framework. The framework is an exemption under Regulation D Securities Offerings that would allow startups and small businesses to raise a limited amount of seed and growth capital from their social networks using SEC-registered websites. Their framework was the basis for the three Crowdfunding bills considered by Congress and was endorsed by the President. It passed the US House in November, 2011, 407-17 and the US Senate on March 22, 2012 as part of the JOBS Act 73-26. The path from idea to law in 579 days can be found at: www.startupexemption.com . About The SoHo Loft Capital Creation Events The SoHo Loft Capital Creation (TSLCC) Event Series is the only global event platform where accredited investors; accomplished angels; CIOs of investors; merchant and investment bankers; VCs; family offices; incubators; private equity firms; pre-IPO mutual funds; equity analysts; entrepreneurs; legislators and legal and tax professionals from across the world assemble in order to exchange ideas, discourse and opportunities that will help reshape the capital markets and stimulate economic growth. Our mission is to help develop the infrastructure of the rising private markets so that it may mature into a viable and functional institutional marketplace that facilitates capital formation, innovation, expansion and job creation. 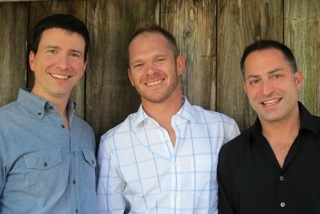 For additional information please visit us at http://thesoholoft.com and www.facebook.com/TheSohoLoftevents . LOS ANGELES, CA, Mar 21, 2012 (MARKETWIRE via COMTEX) — Today, the JOBS Act took one step closer to becoming law. On the heels of the JOBS Act passing the Senate cloture vote by a wide margin (with two amendments pending) — which will allow companies to offer securities to non-accredited investors via crowdfunding platforms — the launch of the Crowdfunding Accreditation for Platform Standards (CAPS) program is the first significant milestone adopted by the industry. The CAPS program establishes standards for crowdfunding operations and aims to protect investors from fraud. As the industry begins the process of creating a self-regulatory framework, CAPS — which will govern the accreditation of crowdfunding platforms — will be a key pillar within this framework. Following an initial private invitation-only launch, eight organizations — Crowdcube, Grow VC, Crowdfunder, GreenUnite, HelpersUnite, Symbid, Give A Little and Fundrazr — have been accredited by the CAPS program and another 20 organizations are currently undergoing the process. More than 200 crowdfunding platforms are expected to apply for accreditation in 2012. Journalists interested in speaking to a CAPS Council member or learning more about the program can contact Jennifer Moebius at jennifer@moebiusink.com. Startup Exemption is the name Sherwood Neiss, Jason Best and Zak Cassady-Dorion created to describe their CrowdFund Investing (CFI) framework. The framework is an exemption under Regulation D Securities Offerings that would allow startups and small businesses to raise a limited amount of seed and growth capital from their social networks using SEC-registered websites. Their framework was the basis for the three Crowdfunding bills considered by Congress and was endorsed by the President. It passed the US House in November, 2011, 407-17 and the US Senate on March 22, 2012 as part of the JOBS Act 73-26. The path from idea to law in 579 days can be found at: www.startupexemption.com. Founded in 2010, the industry website Crowdsourcing.org is a neutral organization dedicated solely to crowdsourcing and crowdfunding. As one of the most influential and credible authorities in the crowdsourcing space, Crowdsourcing.org is recognized worldwide for its intellectual capital, crowdsourcing and crowdfunding practice expertise and unbiased thought leadership. Crowdsourcing.org is an initiative by massolution, a unique research and advisory firm specializing in crowdsourcing and crowdfunding solutions for private, public, and social enterprises. More information at www.crowdsourcing.org .